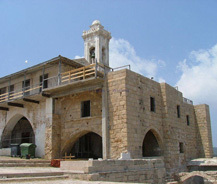 This monastery is used to be the Orthodox Church of Cyprus, which is oftenly visited by pilgrims nowadays. St. Andrew's Monastery is at the tip of the Karpas and is devoted to Saint Andrew. There has been a miracle concerning with Saint Andrew. It is told that, when the ship of St. Andrew anchored to the island, a fountain has revealed and that healed the blind captain of the ship. In 12th century, a monastery was existed, which is the place where Isaac Comnenus and Richard the Lion Heart has negotiated concerning with the surrender of Isaac Comnenus. After nearly 300 years, in 15th century, the Chapel has been built which is remained as the oldest structure.